Directly from the diva of desserts! 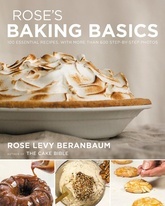 In this book of no-fuss recipes everyone should know, trusted baking expert Rose Levy Beranbaum guides you through every recipe for can’t-fail results—with a streamlined, simplified approach and more than 600 mouthwatering and instructive photos. Whether you're a baking enthusiast or just want to whip up the occasional treat, you will be able to easily make perfect brownies, banana bread, holiday pies, birthday cakes, homemade bread, and more, with recipes including: Peanut Butter and Jelly Thumbprints, Peach Cobbler, Milk Chocolate Caramel Tart, and more. Throughout, Rose shares her unique tips and methods for unlocking the secrets to the best flavors and foolproof results, for a treasury of essential recipes you'll use forever.